We all need a Freedom City. Since the invention of cities, they have been multicultural sites where opportunity, knowledge, and the arts draws those from monocultural communities nearby and afar. Today, our cities are not doing enough to protect the people who live there. Police forces unfairly criminalize Black/Brown bodies through policies and practices which target our neighborhoods. Federal Agencies are cracking down on unjust immigration policies, which ignores the role the United States and other Western countries have played in shaping the Global economy which has caused this crisis in migrant labor. Over the past few years we have seen a resurgence in grassroots movement in the United States, many with a sense of justice and set of principles often captured in the phrase “intersectionality”. This phrase means many things, but at it’s heart it’s about recognizing that we do not live in just one component of our identity. If we are man, we also have race, sexuality, class, religion, and geographic elements in our identity which shape the experiences we have and how we are positioned in the world. More particularly, for me it means that to stand for an “identity” is to stand for ALL of those encompassed within it, a practice which expands our compassion. Million Hoodies is committed to Freedom Cities because we believe our cities need to push back at the local level to resist collaboration with I.C.E. 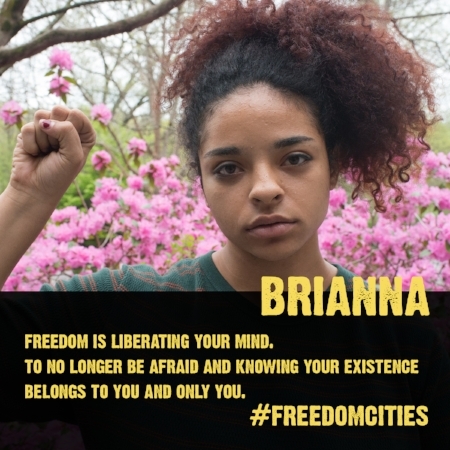 We push for Freedom Cities because we know that the struggles of Black and Brown folks living under US authority are united whether it is the tragic colonial situation of Puerto Rico, the unethical treatment of undocumented laborers, or the experiences of police brutality and mass incarceration. Freedom Cities is for all of us fighting for radical democracy, resisting further violence from the state, and wishing for a world where our cities belong to those who live there.